Reliance Jio has, in the past, called itself India’s biggest startup. True to its billing, it’s now acquiring smaller startups. Jio has acquired a majority stake in conversational AI startup Haptik. The total transaction size, including the primary capital investment, is Rs. 700 crore (~100 million USD), with Rs. 230 crore as the consideration for the initial business transfer from Haptik to Jio. On a fully diluted basis, Reliance will now own 87% of the company, with the rest being held by Haptik’s founders and employees. “We believe voice interactivity will be the primary mode of interaction for Digital India. We are delighted to announce this partnership, and look forward to working with the experienced team of Haptik in realising this vision for offering greater connectivity and rich communication experiences to the over billion Indian consumers,” said Akash Ambani, Director at Reliance Jio. Voice interactivity is something Haptik has been working on for a while. The company was founded in 2013 as a mobile virtual assistant app, but had then pivoted to become a solutions provider for large enterprises. Haptik now builds conversational bots, and has Samsung, Coca-Cola, Future Retail, KFC, Tata Group, Oyo Rooms and Mahindra Group as clients. It claims to have over a 100 bots online, and says it has processed over a billion transactions. 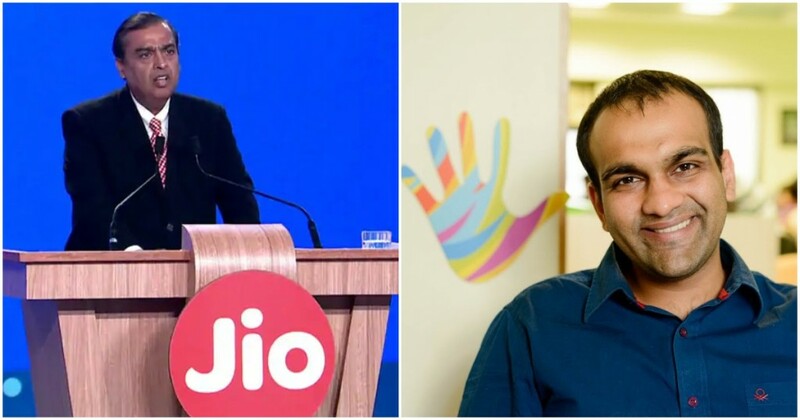 It’s immediately not clear how Reliance Jio will use the Haptik acquisition, but the possibilities are many — Jio runs everything from a streaming service to online magazine apps, and having chatbots in any of these services could prove useful. Also, having Reliance on board will allow Haptik with greater resources, an immediate userbase, to be able to grow its offerings. “The investment by Jio will give us the support and resources we need to massively scale up our operations – enhancing and expanding our platform into one of the world’s largest, with an addressable market opportunity of over 1 billion users in India,” Haptik said. Jio’s acquisition, though, makes it clear that Reliance Jio isn’t averse to buying out other startups to quickly scale businesses. Jio’s initial launch had been hush-hush, and while the company has made investments in some new-age startups, including one in blockchain, it had given the impression that it was keen on building most capabilities in-house. Jio has now indicated that it’s also willing to acquire companies and teams where it sees a natural fit, and this could signal many such tech acquisitions in India’s digital space — nobody in India has pockets as deep as Reliance, and if it starts acquiring Indian tech companies, it could mean many further exits for India’s tech startups.